It is the westernmost island of the archipelago. Even Alicudi, like other Aeolian islands, must have suffered collapses; are test steep steep walls and huge boulders collapsed into the sea. His past history consists of tracks in a residential area of XVII-XVI century BC other traces of the same age there on the top of the island. This suggests that the small farming and fishing were the foundations of prehistoric community. Fragments of Roman pottery are scattered on the eastern coast of the island. The island took part in the trade of obsidian. Even Alicudi subdued barbarian incursions. Overland Tours The western part of the island is made up of uninhabited slopes. 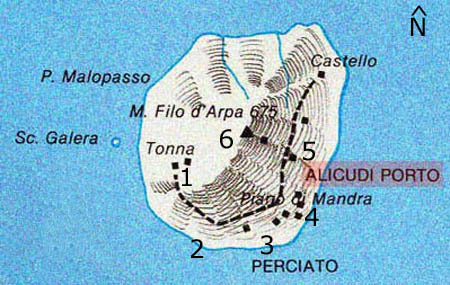 From Alicudi you can make the ascent to Mount "Filo dell'Arpa" (Wire of Harp). From the church of St. Bartolo follow up to the top where you can enjoy a wonderful panorama. The journey in the history of the island leads to the village "Piano fucile" and the natural fortress of "Timpone delle Femmine" (Female's Timpone). Tours by sea Navigating around the island, steep slopes covered with bushes Erica alternate with tiny beaches. Appear "perciati" and caves dug by natural elements as those of the Water and Grottazzo. A typical example of the geological hazards are the "wires", columns of lava modulated by erosion and by collapses of ancient lava rock. For fishing enthusiasts recommend some dive near the Rock of Jalera.